An endorsement of Greepers shoelaces has appeared in Your Autism Magazine. A brand new review of a top product for children with autism. At Living with Disability we have some products we consider our absolute favourites. One of these is Greepers shoelaces. This innovative product range should be celebrated and that’s why we’re glad to see them featured in Your Autism Magazine. We believe in this product and we’re glad to see others do. Your Autism Magazine is the quarterly publication of The National Autistic Society for their members. Their latest issue includes a fantastic, helpful review of Greepers. We firmly agree they are a great investment for children and even adults living with an Autistic Spectrum Disorder. Your Autimsn Magazine’s review shows off the funky red Greepers Laces but the range is much wider than that. All colours from black to purple to neon green are available. Wearers can match their laces to their personality or simply choose those that complement their outfit best. The review also says “Greeper is a special type of shoelace, it looks like a regular bow-type shoelace, but will never come undone. The laces are threaded through a central aperture with four stoppers positioned in strategic places. They can easily be loosened or tightened by the wearer or their parents”. With glowing reviews it’s clear that Greepers are on the up. Hopefully this feature in Your Autism Magazine will further their uptake and widen their appeal. Greepers Laces can be great for children who have difficulty getting to grips with regular laces. They appear identical so there’s no stigma and they give children with disabilities much-needed independence when choosing footwear. Greepers are universal as the parent above said, they can be used with any shoes of your choosing. They’re also a great solution for children who have that annoying habit of repeatedly untying their shoes. With Greepers it simply isn’t possible. Your morning routine rush will be halved as the stress of shoelaces is removed. They are a better option than Velcro or elastic-laced shoes as the level of support is much better. We’ve looked previously at the differences between Greepers and Elastic Laces and it is pretty clear which comes out on top. We’re always pleased when one of our favourite brands receives media coverage. Therefore we are really happy for Greepers and their appearance in Your Autism Magazine. Recent feedback for Greepers Hikers Laces. Peter Greedy who originally invented Greepers for his own children, gets regular feedback from parents with children with autism. As we have said before, the great thing about Greepers is that they are also used by top sports people, so children can emulate their heroes too! 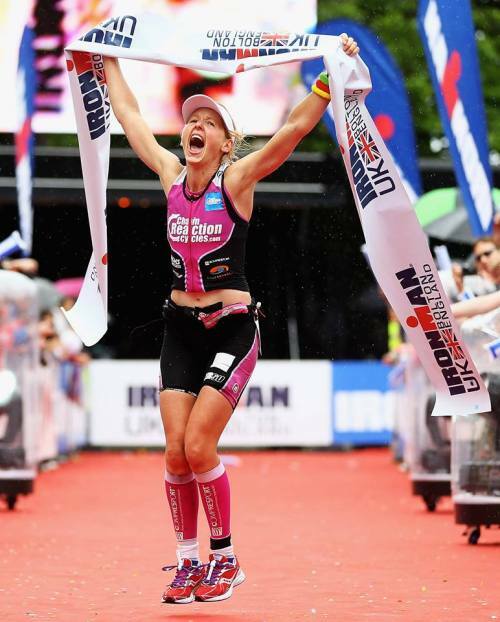 This month also saw Greepers worn by Lucy Gossage winning Ironman UK in a pair of purple ones! This is such a fab pic we had to share it here! Lucy Gossage winning Ironman UK wearing a pair of purple greeper laces! As we mentioned above, Greepers are the best laces for athletes and have just been recommended again in the 220 Triathlon Magazine’s new edition (April 2014). They have a feature “Race Day Kit” essentials and Greeper Laces are one of the chosen products and given the top rating and the award BEST ON TEST. “We’ve tested Greeper Laces before and, despite fierce competition from French outfit Xtenex and their bobbly efforts, in our eyes – and on our feet – the UK product continues to lead the way.For those new to tri or 220, the traditional lacing system is replaced with a brilliant mechanism that requires no tying. Simply guide the Greeper through eyelets in reverse before clamping in place at the toe end via a miniature plastic connector. Back at the tongue end the ingenious toggle requires a gentle tug of its protruding loops to tighten. Pull the toggle to ease pressure. Sprinkling your shoe with talc and a modicum of practice will have you T2-ing faster than ever before. But, more importantly, your foot feels secure – unlike other systems that can leave your foot slipping about like Bambi on ice. Final top tip. Buy some @GREEPER_LACES. Cheap, keeps your feet secure, won’t come undone & % goes to charity!